The group of cyclo drivers in their bright green shirts patiently wait. Every so often, one ushers someone in the group toward their cyclo and steadies the bike as the passenger sits down. She is soon steadied again as the tour guide beckons her out of the cyclo and back to the group. Cyclo drivers waiting to take us around town. We gather in front of the Old Post Office in Phnom Penh, preparing for our morning tour with Khmer Architecture Tours. Virak, our guide, is an energetic Master's student of Architecture with a mischievous smile and a self-professed love for minimalist design. Our guide explaining the ill-fate of the old 1930s Commissariat. It has been sold to a private investor and will most likely be torn down. Experts believe there are five stages of culture shock, or cultural adjustment, when someone experiences a new environment. In three hours, I found myself moving through all five stages at lightning speed. Stage 1: This tour seems like so much fun! The cyclos continue to circle around the street as we walk through the old Post Office and around the 1930s Commissariat. I can't wait to hop into my cyclo and ride around the city in a new way. I love learning so I'm trying to follow along as best I can to understand the intricacies of tropical building design, the fate of many of the structures built in the Colonial period and catch some of the Cambodian jokes Virak throws in throughout his talk. His best line of the day, "You will see many wats or pagodas around the city. We call them pagodas, but you can call them "wat"-ever you want." We cross the street from the Post Office and move to the old Hotel Manolis, built in 1910. It had been a grand hotel years ago, but is now faded and in need of some repair. 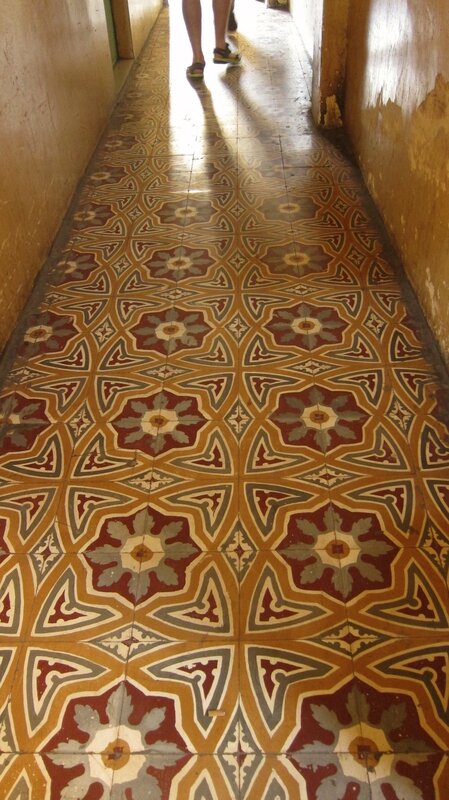 We head up the original wooden stairs and see some of the beautiful imported tile still lining the hotel's hallways. Original tile floor lining the hallways of the Hotel Manolis. Women and children walk through our group, heading downstairs. We walk along the old hotel rooms which now house families who have moved into the hotel. It is not sanctioned housing and the families are living in very small spaces and using the hallways for makeshift kitchens and other storage. Following the fall of the Khmer Rouge in Phnom Penh, people moved back to the city and claimed any space they could inhabit. There were no property laws so where one stayed, it became their home. You can still see faded numbers on the original wooden hotel doors. Doors that no longer require fancy hotel keys now may not even lock at all and contain a family's livelihood. Stage 3: Okay, I'm starting to understand more and riding in this cyclo is sure fun! We fall into our routine of 15 cyclo ducks riding in a row up and down the streets Phnom Penh. We figure out how to sit in the seat without tipping over and we remember which driver is ours as we get in and out to look at other buildings. I know enough now that this tour is not so much about architecture, but about lives that continue on through all circumstances - colonization, communist rule and rebuilding. We head north to visit some of the Chinese inspired buildings and temples. It's the Sunday of the Chinese New Year celebration and we visit Xie Tian Gong temple in the midst of prayers and offerings for the new year. Large bunches of incense are lit throughout the temple and a roasted pig is on a table surrounded by all kinds of fruit. The bright red, white and black striped ceiling is our circus top and we're in the center ring, surrounded by happiness and wishes of good fortune for the next year. We leave on foot from Xie Tian Gong to visit another Chinese temple and a Christian Church. Virak leads us down a small alley and we pass open doorways which reveal one-room homes where families are cooking, doing laundry, drinking large quantities of beer and coming to look at those passing through. Virak stops abruptly and points up. We're in the middle of the Jade Mountain Temple, the last wooden temple in Phnom Penh. It's not much of a temple anymore. The intricate roof with gold-backed lettering stands as a shelter for the makeshift homes that have been built underneath. Virak asks for our attention and very seriously tells us that these living conditions are very normal for people in the city. The chasm between the rich and the poor in Phnom Penh quickly becomes apparent and we're brought back to the realities facing the people of Cambodia. I smile timidly at the women and children who are watching us walk through their community. The children often smile widely and say "hello" in English. We continue down another alley lined with more homes and reach an entrance to the Chapel of the Sisters. Virak tells us that we'll walk quickly through and then meet on the other side. This isn't a great area to stay in he warns us. The church is exactly like the temple before it. A structure that once was, now turned into makeshift homes. The church is different though. It's pitch black inside the hallways and I turn on my phone's flashlight so I can see where I'm walking. The residents of the church aren't as friendly as they watch us invading their space. I'm uncomfortable, not for any reason but the real look into life here and the acknowledgement of how differently I live in this same city. We meet Virak in a wider alley and see our cyclo drivers at the end of the road. We learn that the structure we just walked through has been many things over the last century - a church, a type of Vietnamese embassy/meeting place and even an orphanage. Women are sitting at a table playing cards and kids are jumping rope, laughing and making fun of each other. My head and heart feel heavy as Sitha greets me back at his cyclo. We continue on our tour, visiting the National Library, the former Canal de Verneville and looping around the Phsar Themy (Central Market). My mind is racing as we learn more about the Khmer Rouge and the lives it left behind. The National Library's entire collection was destroyed when the regime took over Phnom Penh and the space was used as a kitchen and slaughterhouse for pigs and chickens. The library's books have slowly been replaced by overseas donors and other organizations, but the building is too small to really house a true library collection. The French and Khmer inscription on the walls of the library capture our day and most likely will describe our entire experience here, "The power is temporary, the ideas chain you forever." The French inscription on the National Library. Overall, the tour was light on architecture given the destruction of so many buildings since the mid-1950s, but it was big on awareness and enlightenment. 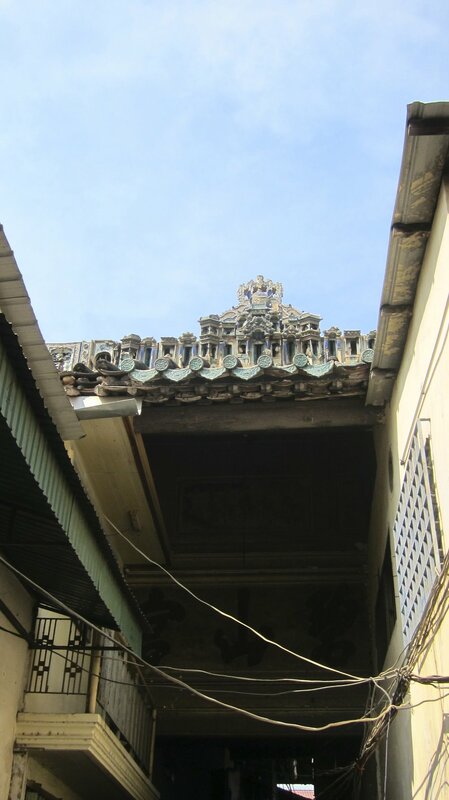 Khmer Architecture Tours conducts tours around the city every weekend. 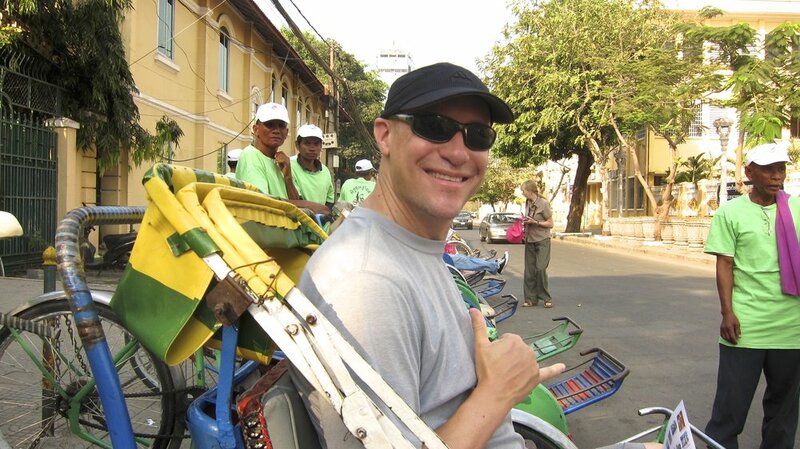 Most are walking versus cyclo tours, but there are a variety of options. The site includes walking maps if you want to head out on your own.